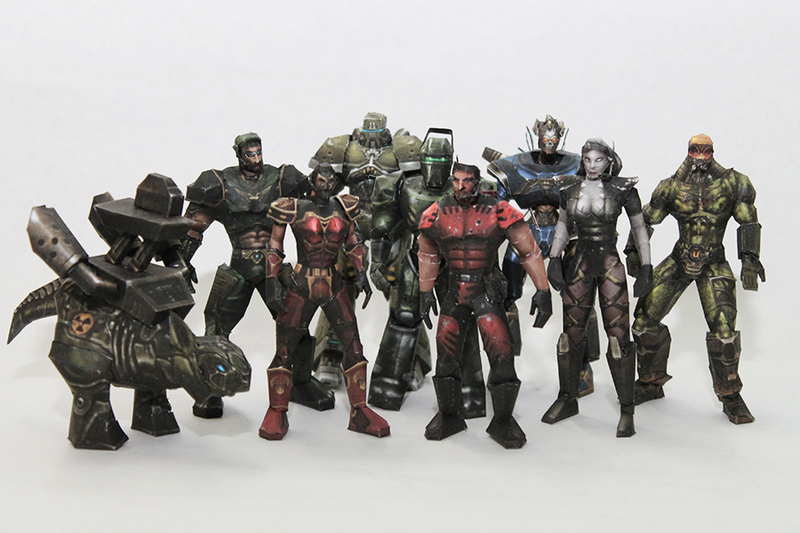 Show your love for Unreal Tournament (1999) on your desk by building these paper Unreal Tournament characters! Build your favorite player character, you can even apply a custom skin on it! So the time has come to prove you are the best. To impress your friends and build the papercrafts! Will there ever be any papercraft for Unreal 2? Not even the U2 Skaarj? EvilGrins wrote: Not even the U2 Skaarj? I like the U1 SkaarjLord and the new UT4 Skaarj texture so much. I never saw the Unreal 2 ones, although maybe in the Wiki in the Skaarj page I saw about the Light, Medium and Heavy ones (and the light one looks fat in that image in the Wiki ). Wow! Can I place a order for the blue warboss? I'm actually willing to pay for that one. Terraniux wrote: Wow! Can I place a order for the blue warboss? I'm actually willing to pay for that one. This is so awesome. There should be little guns and stuff to go with them! Maybe even make some poses too. Not sure how paper crafts work though haha. Would I be correct in assuming these things wouldn't survive a battle in a bathtub?